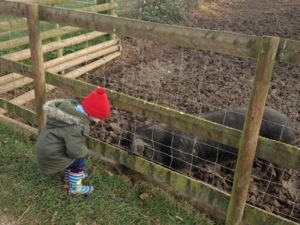 We were sent some family tickets to visit the adventure farm at Hatton Country World, with passes to see Santa. With only two weekends left until Christmas, and presents still to buy, we thought we better get going yesterday! It was a cold but lovely sunny day so we wrapped the kids up and jumped in the car. It’s about 15 miles down some lovely roads to Hatton from where we live, so didn’t take us too long. When we got there just before 12pm, the car park (free parking, always a bonus!) was already filling up. 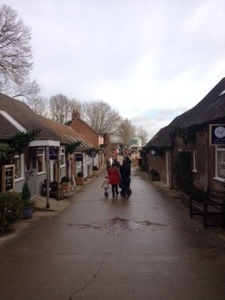 We had a quick wander through the shopping village, which hasn’t changed much since I last went when I was a little girl – lovely little shops selling candles and soaps, garden ornaments, homewares, pretty furniture, toys and more. 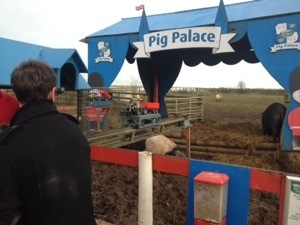 There was a small queue to get into the farm but it moved fairly quickly. To pay for our tickets would have cost us nearly £30 (and that’s with Alex being free as he’s under 2!) so not the cheapest day out. The farm though, to be fair, is huge. Including a half hour stop for lunch it took us a good 4 hours to go round. The first thing we did was visit the JCB track, a child sized ‘road mat’ with ramps, cones and tunnels with ride on JCB diggers. Having two digger mad boys, this was a great start to our day! There were plenty of toys to ride on even though it was busy – a nice surprise! When we finally dragged them away we saw the goats and pigs, which we had fun feeding. You can buy a cup of animal feed for 50p from the kiosk as you walk in. We then wandered down to look at the birds before coming to an attraction where you could pan for gold. Sounds fantastic but it was deserted and the water looked filthy, so we quickly moved on! Next to this was another attraction which looked to be some sort of duck race but again was deserted and looked like it had seen better days! The leaflets and website advertises ‘festive fun fair rides’ but to be honest these were really disappointing. 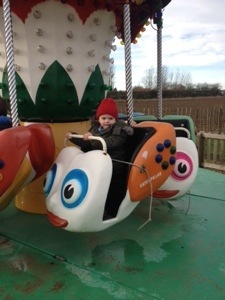 Three tiny little rides – a spinning teacup ride, a ladybird ride and flying caterpillars – not festive in the slightest. Not only that, the one wasn’t working. Still, the kids had fun. 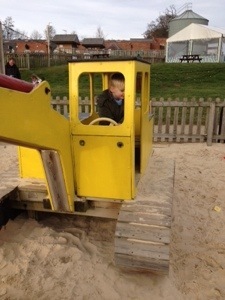 We then played on the climbing frame, had a bounce on the trampolines and played on the tractors. 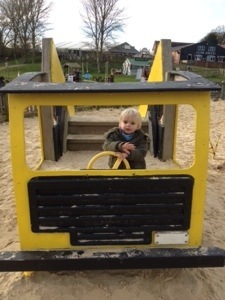 We especially loved the digger sandpit, which considering it’s a farm and the time of year was spotless and lovely. 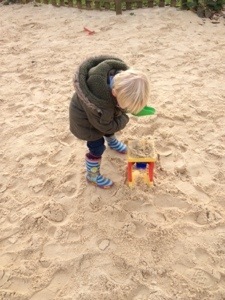 The kids really enjoyed using the buckets and spades and climbing on the equipment! We them went to my favourite bit – the animals! There was a lovely variety of animals including donkeys (in a nativity scene!) sheep, goats, pigs, alpacas, rabbits which were all really friendly and tame enough for the kids to stroke. Plenty of places to wash hands and lots of signs to remind you as well. 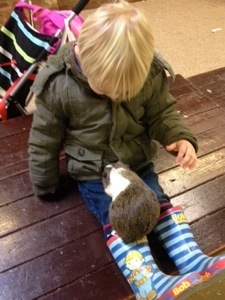 We loves the guinea pig petting area. Harrison loved holding them! By this point it was almost 2pm and we were hungry! After a quick loo stop and nappy change (toilets ok but definitely room for improvement!) we went to the restaurant attached to the soft play centre – and immediately walked back out ! Absolutely full to the ceiling, noisy and no where to sit. We left the farm area (wristbands allow you to go in and out) and went to another restaurant/coffee shop which although lovely wasn’t really toddler-friendly. 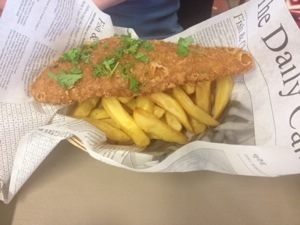 There were limited food choices – cakes, soup, paninis and one or two meal options and that was it. It cost us almost £18 for a bottle of pop, hot chocolate, a pot of tea, a scone and some fish and chips, which were all very nice. Then we paid a visit to Santa. Sadly at this point my phone went flat so I couldn’t take photos! We walked through the elves workshop and winter wonderland which was really magical and enchanting. There are little tables for kids to write letters to Santa. The queue was quite long but moved fairly quickly, but it was a lovely wait surrounded by trees, lights, penguins and polar bears! When we got in to Santa the kids went a little shy (nothing unusual for toddlers!) and didn’t really speak. I have to admit, ‘Santa’ really annoyed me as he said that Harrison ‘should be speaking at his age’ – he’s 2, and quite rightly is weary of strangers. I was not impressed! The kids were given keys to choose a present from the toy shop, which was huge and had a massive choice of gifts suitable for all ages, and we’re pretty decent gifts. 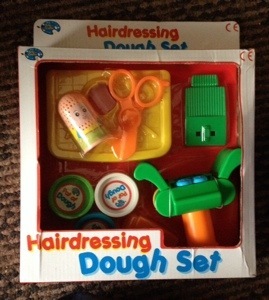 Harrison chose a hairdressing play dough set and we chose some animal foam stickers for Alex. After coming out we fussed and stroked the reindeer and then decided it was time to head home as it was nearly 4pm. We hadn’t had chance to visit the kids disco or magic shows. It was starting to get dark and with the fairy lights around and the Christmas music playing through the speakers it was really pretty and festive. As we walked back towards the car we had our complimentary mince pie and delicious mulled fruit punch whilst listening to a kids choir singing Christmas songs. 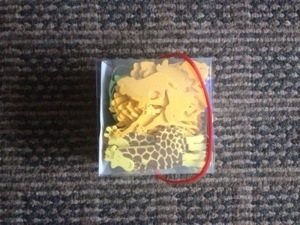 .For more information visit their website Hatton Country World.